Ellie is wonderful. She is getting brushed regularly. Has play time with us and is walked several times a day. We even went for a hike last weekend. My cats are not coming around to her yet... but I'm confident that they will in time. Barking is still minimal... she is sooo well socialized. We are very happy with her. Marlee is 16-months old. She is about 80 pounds and has a tail that curls tight. She was acquired from a farmer as a pup. Her person did a lot of work with her. She sits and downs for liver treats very fast! She is very good on leash, too. She was raised with children. She also had a house full of cats and another older dog. So, she is well-socialized and was handled a lot at the crucial time in her life. Her family's, when she was 8 months old, situation changed. She was then adopted to another person. Unfortunately, she was tied out on a pinch collar. Her person did not know how cruel this was. We do not allow dogs to go on tie-outs of any kind. Her adopter developed allergies and that is when she came to us six months later. She was then adopted by a family who fell in love with her. Things were okay for a bit, but as time went on, the other female dog did not see eye-to-eye with Marlee. As can happen, the fighting increased. You can’t make dogs like each other. Her family is very distraught at havingto give her up but did the right thing by surrendering her back to us. We want Marlee go to her forever home. She is a lovely girl who just wants someone to make her part of their family, take her places in the car (weather permitting), groom her, feed her the best of food, have available fresh water, a place to sleep (your bed would be great), take her for hikes and walks, and let her play with other dogs. She did do a couple of poops in the house during the first few days but once she got the house routine she was solid. She's much more used to the cats now. They could jump off of a table in front of her and she'd do nothing whereas in the beginning she'd give chase. She does bark a lot even when in the home. She's responding to other dogs barking in the neighbourhood. Once they get used to the same noises, the barking will subside but know that they do bark. She was coming when called most of the time. I think she may have been just following the other two. I always had liver treats ready for them when they came in. She likes to play pull the toy. She loves going in the car with the other two when I'd do errands. It is very important to do your research on any breed before deciding if they are a good match for your family. I'm happy she's doing well. She is truly a gem. Thank you for your interest in Marlee. She has been adopted. She is not purebred in that she does not come with papers nor does she have a tattoo. 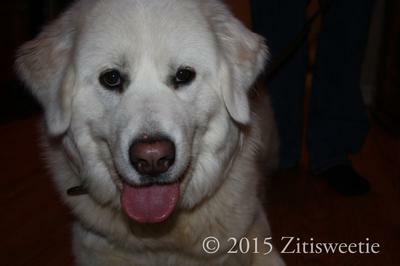 She is full Pyr, I suspect. She is a closer to a high-ranked girl. She is young and needs much exercise. We require an adoption donation of $350 when we adopt our dogs out. In any case, she is happily with her new family. I would be interested in Marlee as well. I have the same questions as the comments above mine. I have had 3 pyres, two were mixed and my last was a pure read who died of cancer in Oct 2015 at the age of 10 years. She was very gentle, never barked and was a wonderful pet. 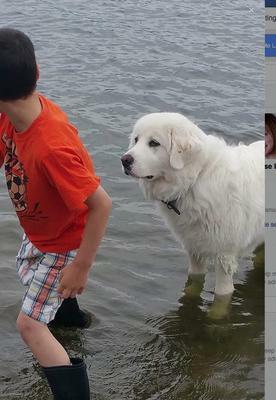 I am a senior and would like the company and ,capable of taking her for walk and only want a pyr but cannot afford to pure chase one. I would appreciate talking to someone about this dog. 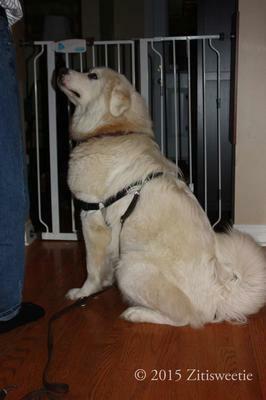 Is Marlee a pure bread Pyr? To me she looks like part golden. How is she re noise sensitivity: Thunder, fireworks, vacuum ? Regarding disposition; does she lean more towards an alpa, guard dog or, easy going, stranger welcoming, pack dog? Does she prefer to be at your side winding around your feet, jumping around you or, laid back & watching? How is she re grooming? Is she a nipper? She sure is a pretty girl!